Most films are launched by the best entry and continue with subsequent sequels over a steady course of decreasing returns. The Mission: Impossible spy movies, however, buck that trend. By and large, these flicks just seem to keep getting better and more focused. This has a lot to to do with the point at which the series started. The 1996 Mission: Impossible picture that kicked off the franchise was a web of switching allegiances that unraveled into a convoluted mess. I still won’t spoil the plot of a near 20 year old movie, but it actually managed to dishonor the heart of the original TV show. Fast forward to the 4th installment, 2011’s Ghost Protocol, and it achieved an apex. Now we have number 5. While Rogue Nation doesn’t quite reach the heights of its predecessor, it’s still an efficiently written, well acted and directed thriller overflowing with stunts infused with a healthy dose of wit. The story has Hunt as his team trying to prove the existence of The Syndicate. This is some evil international organization intent on taking down Tom Cruise and the rest of the Impossible Missions Force. Rogue Nation assembles some familiar faces: Tom Cruise along with Ving Rhames are a constant in every film. I suppose there will come a day where Crusie will be replaced by a younger actor. I must say though, given his superhuman feats of derring-do, that day isn’t any time soon. He exudes nothing but the aura of a vibrant action star. 53 years old never looked so good. Simon Pegg, and Jeremy Renner have reunited as well. The men are a bit more consistent. The Mission women on the other hand, are a revolving door. Past femme fatales Thandie Newton, Michelle Monaghan and Paula Patton are out. Swedish actress Rebecca Ferguson as Ilsa Faust is in. A welcome addition, she plays an able bodied agent whose mysterious loyalties are unclear. MI:5 starts off with a seemingly death-defying action extravaganza that has Ethan Hunt jumping on a plane to seize some missiles loaded with nerve gas. That he must cling to the outside of the plane as it takes off is par of the course for this globetrotter. It’s hard in this day and age of computer effects to impress with stunts anymore. That the mighty feat is seemingly accomplished without the aid of computers adds to the excitement. Sometimes it’s a sprint through the streets of London or swinging on a curtain rope backstage at the opera. Other times a car chase through the winding roads of Casablanca morphs into a a motorcycle race through mountain highways. How about a soaring altitude jump into a massive circular tank of water where our hero must hold his breath for SIX minutes. He must swim to the bottom of an underwater tunnel to switch out a profile card to allow his associate unrestricted access into a maximum security stronghold. The action never fails to thrill. 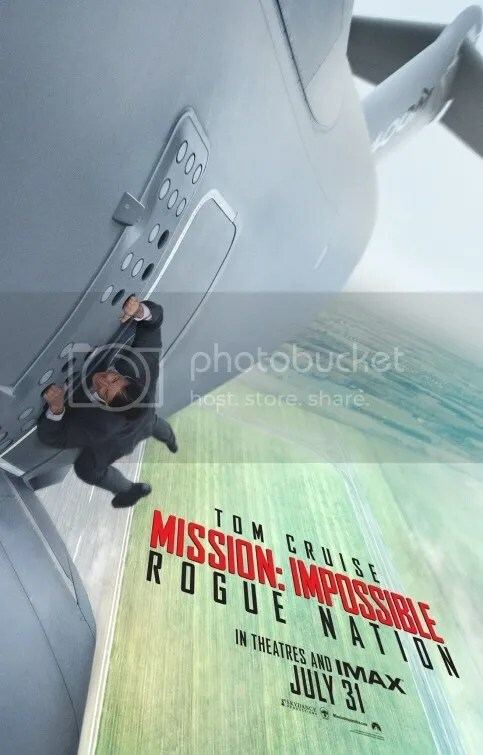 Christopher McQuarrie is the writer behind Valkyrie (2008), Jack Reacher (2012) and Edge of Tomorrow (2014) – all movies starring Tom Cruise, The two have joined forces again for Mission: Impossible – Rogue Nation where McQuarrie also directs the actor for a second time. Their close working relationship produces a lively production that is high on fun and low on overwrought complications of the earlier entries in this franchise. Colorful stunt-filled escapades dramatically utilize the full scope of the wide screen. In truth, the production is little more than a series of athletic exploits that dazzle the eye. Yet each tableau is so great that any one of them could easily serve as the climax of its own film. The excessive 2 hour+ run time does wear on the viewer. Call it too much of a good thing. Still, it’s the breathtaking stunts that genuinely sell this picture. Can I emphasize how much this Hitchcock fan truly appreciated that “Man Who Knew Too Much“-inspired assassination attempt at the Vienna Opera House? Well I did…a lot. Let’s set the record straight. Sherlock Holmes is a fictional character that was featured in 4 novels and 56 short stories written by Scottish author Sir Arthur Conan Doyle. Mr. Holmes then is a fabrication that envisions the imaginary sleuth as a 93-year-old reflecting back on how a case ended his career 30 years ago. The thing is, the picture is so meticulous, so deliberate and so…uh…well sluggish that you might be inclined to actually believe that this is the carefully studied profile of an authentic man. This is the latter day experiences of an erudite detective where entertaining embellishments are frowned upon in service of reverent restraint. Writer-director Bill Condon and actor Ian McKellen have worked together before in Gods And Monsters. There the chronicle also centered on a life story. The difference is then it was director James Whale, an actual person. This time we’re detailing a make-believe guy. 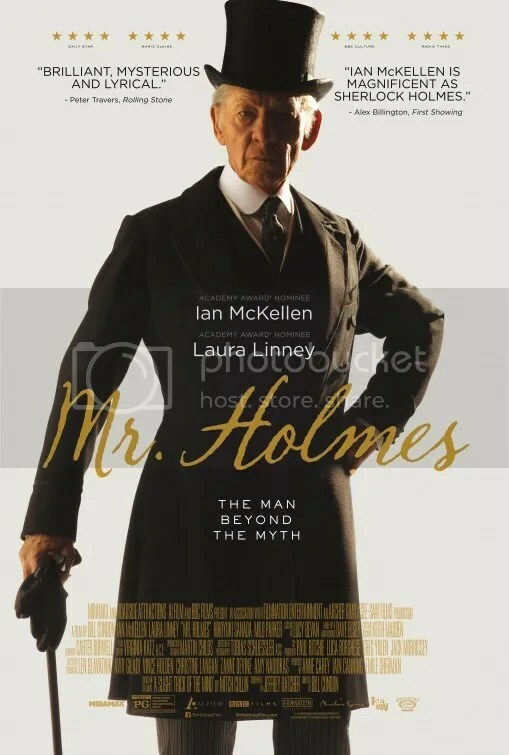 Mr. Holmes is a handsomely mounted production to be be sure, but one whose sole joy rests in watching a talented thespian act. Sir Ian McKellen, that English Academy Award nominated star of stage and screen, beautifully embodies the role of the agent in this dignified feature. He has a certain presence, but why so serious? This is a fantasy, not a biography where slavish attention to detail is a must. We could have used a little more fun perhaps. Accompanying McKellen are Laura Linney doing her best Emily Watson impression as his housekeeper and young Milo Parker who evokes Freddie Highmore as her son Roger. The allusions to other actors are in no way meant to negate their fine work here. As a mater of fact, Ian’s McKellen’s scenes with budding star-in-the-making Milo Parker are the highlight of this production. The child has a precocious air that is quite endearing and never grating in the way some youngsters can be encouraged to act. Roger is the inspiration for Holmes to re-remember a mystery from his past: his last assignment. Roger is fascinated by the private investigator and his emotion captures the audience’s interest. Numerous flashbacks recall these details. There’s a lot of jumping around – first to a recent trip to Japan – then 35 years into the past. This for little apparent reason other than to utilize old age makeup on McKellen for the modern setting. Honestly the change isn’t all that dramatic. The real problem is, the case at hand isn’t very interesting. Mr. Holmes has its moments, but if I may quote another English literary character: “Please, sir, I want some more”. There just isn’t enough here to sustain a film. Ultimately it feels more like the studious artifact of bygone history than the fanciful re-imaging of a fictional super sleuth. An effective documentary sheds light on a subject heretofore seen as an an enigma. For those casually aware, Amy Winehouse was a troubled singer that fell prey to the perils of drugs, drinking and that catch-all term we call the rock & roll lifestyle. To many she was a lamentable figure gifted with the soulful voice of an artist twice her age. Her existence cut short at 27 by her own self destructive behavior. On March 23, 2011 Amy recorded the duet “Body and Soul” with Tony Bennet. 4 months later to the day, she died. Director Asif Kapadia assembles a portrait of a vocalist we apparently didn’t know at all. The chronicle charts Winehouse’s life from her childhood in Southgate, North London, to her death in 2011. Her hard partying public personae was the subject of talk show hosts’ jokes, but privatively she was a depressed soul needing guidance, someone to say “No” to her vices. Amy’s mother, Cynthia, reveals she was afraid to get tough with her young daughter. Amy told her mom she was “too soft.” Amy’s parents’ divorce when she was 9 is a turning point that negatively affected her behavior. By 13 she was already on antidepressants. Kapadia interviews her friends, family members and the collaborators who knew her. These sound bites play as recorded narration behind home videos. Few had the intimate picture of Winehouse as her first manager, Nick Shymansky. Her early path to fame taped with a cheap video camera. Her raw talent on full display along with her addictions, depression and bulimia. Both sides are recounted through newly assembled interviews, rare photos and unearthed films. Director Asif Kapadia presents a legend-in-the-making. What impresses is the striking contrast between the simplicity her life before she achieved massive fame and the way it changed afterward. The frail singer dogged by aggressive swarms of paparazzi stalking her with flashbulbs that go off like strobe lights in a disco. 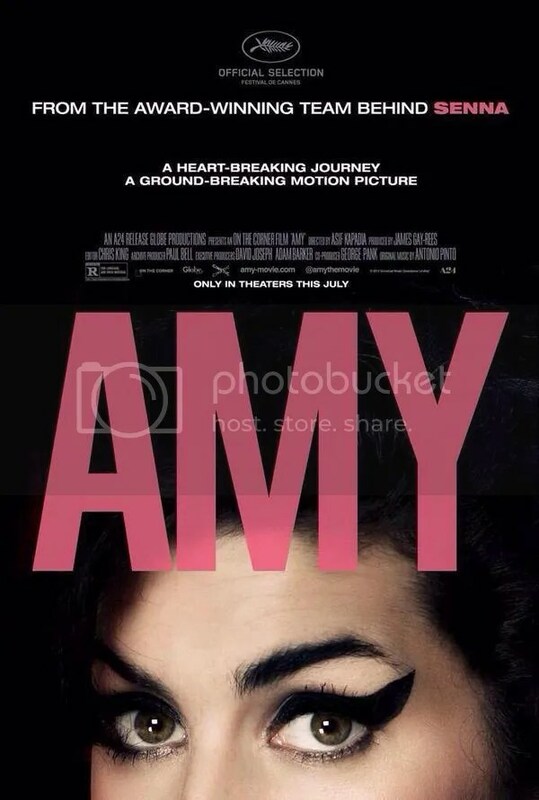 Amy was driven by a love of jazz music but also plagued by demons. She was unprepared for the rabid notoriety she archived. By the time of her final concert in the Serbian capital of Belgrade, she was a woman completely unraveled. Unable or unwilling to even perform as she stumbled about the stage in an apparent daze while thousands screamed for her to sing. What ultimately comes through is the tender portrayal of a shy but gifted singer whose outrageous conduct often overshadowed her stunning talent during her lifetime. Friend Tony Bennet compares her to the likes of Billie Holiday and Ella Fitzgerald. It might sound like hyperbole, but coming as it does near the end of this documentary, it sounds perfectly reasonable. It’s getting hard to summon up the enthusiasm for these superhero movies. There’s just so many of them. Oh and why must each one start with a convoluted origin story? Over the last 10 years we’ve seen as many as 11 comic book adaptations come out in a single year. That was 2011. Since then the sheer number of offerings has declined so perhaps we’re in a bubble that’s about to burst. That’s a shame because a few have ranked among my favorites in a given year. Guardians of the Galaxy is an example that transcends the genre. Unfortunately that’s an exception. For every Avengers there’s an Avengers: Age of Ultron. Which leads me to the latest offering. Ant-Man isn’t terrible but it is far from required viewing. Even though former systems engineer Scott Lang has been released from prison, he’s a good guy at heart. His crime? Breaking into a shady corporation and transferring money back to workers who deserved it. So he’s like a modern day Robin Hood. Now that he’s a free man, he’s determined to help support his young daughter. She’s an adorable little moppet that gets ample screen time to be cute. Continuing the family angle there also former S.H.I.E.L.D. Agent Hank Pym (Michael Douglas) and his adult daughter Hope van Dyne (Evangeline Lilly). They have some unresolved issues to work out too. How about some more great actors cast as random people? Michael Pena is conspicuous as a member of Scott’s heist team. Pena emphasizes his ethnicity by speaking with an exaggerated Mexican accent. His sidekick character will either be amusing or cringeworthy depending on your tolerance for ethnic stereotypes. My audience giggled. I was quiet. But this is Scott Lang’s story. Apparently stealing things is his sole hope of earning a living. First Scott steals a suit that shrinks him down to microscopic size. Then he uses the technology to steal more things. Yup. 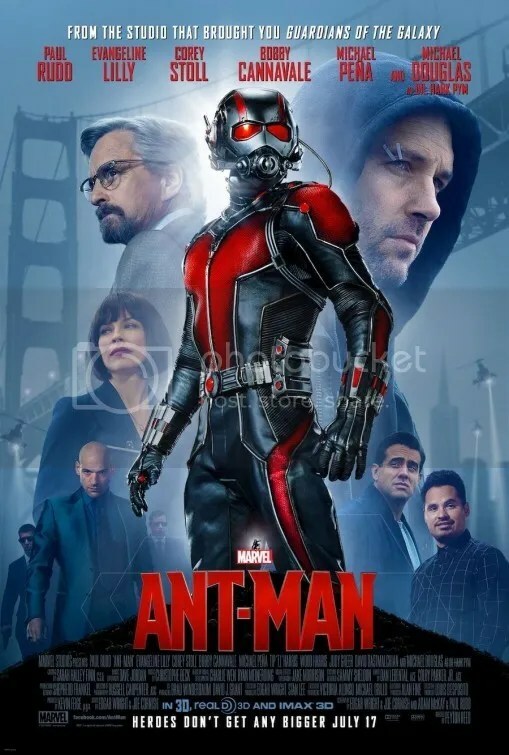 Ant-Man is a heist film. The best moments involve humor. Yet the giggles are pitched at very young viewers, the humor marked by a jejune mentality. “Whoa! I can’t believe things that are usually small now look big!” is that what the audience is supposed to think. Personally I couldn’t stop thinking this feels like a made for TV movie for the Disney channel. With a few judicious edits for language, this PG-13 could easily be PG. The script has a favorably lighthearted attitude at least. “Isn’t the idea of a tiny masked vigilante kind of stupid?” it winks at us. Part of you laughs with the filmmakers because sometimes they’re in on the joke, and part of you snickers at them because sometimes they aren’t. The action is really generic. No conflict is ever too complicated that it can’t be resolved with another fistfight. There’s several. Each one is uniquely staged I suppose. Call it Honey I Shrunk the Superhero! But if that’s the only novelty that this picture can offer (and it is) then that’s hardly innovation. Ant-Man is a boilerplate superhero production. It reinforces the (unfair) accusation that, if you’ve seen one costumed crime fighter film, you’ve seen them all. It was only a matter of time before the Minions, those breakout stars from the Despicable Me movies, got their own picture. You already know whether you’re going to enjoy this. If you appreciated their antics in the aforementioned films, then you should find this to be the bee’s knees. On the other hand, if you walk in begrudgingly detesting those lovable rapscallions, then you’ll undoubtedly just go on hating them with clenched fists and a closed heart. Theirs is a physical comedy part of a rich tradition that is an evolution of slapstick and farce. Buster Keaton begat The Three Stooges who begat Jerry Lewis who begat Benny Hill who begat the Minions. The word evolution is particularly apropos in this case. 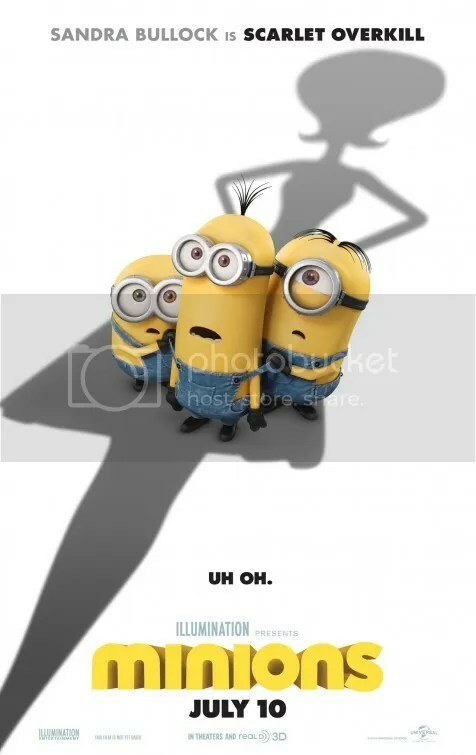 Minions commences with the very dawn of time. Starting as single-celled organisms, we see the Minions evolve through the ages. In every era they unceasingly serve a litany of only the most despicable of masters. From Tyrannosaurus Rex to Dracula to Napoleon, they go through one boss after another, accidentally killing off each one due to their own clumsiness. Our proper adventure begins when the Minions (all voiced by director Pierre Coffin) find themselves without a master to serve. Then one Minion named Kevin decides to change things. He has a plan to find a new master. He’s taking two buddies, Stuart and Bob. These three, who bear a striking style similarity to Gru’s 3 daughters, travel cross the ocean. They visit New York City first – circa 1968 or 42 years B.G (Before Gru) – before winding up in swinging mod London. The setup lays the groundwork for a nonstop silly fun fest. Granted, the Minions are not known for their sophisticated wit. In fact most of their communication is a dialect that is mixture of English words peppered with foreign phrases. It’s a creative amalgamation of vernacular where syntax is key. Humor is derived from being able to interpret their Minionese within the right context. Although you don’t understand the vocabulary, you feel what they’re saying. It’s not hard to grasp. Kids in particular appreciate their lighthearted ability to adapt to whatever situation they must face. It’s an admirable quality. Their business takes them to something called Villain-Con in Orlando. The city is presented as swampland in 1968 but it’s perhaps no small coincidence that the studio responsible for this, built a resort there in 1990. Villain-Con is clearly based on San Diego’s Comic Con but functions as sort of a delegation for the most evil supervillains ever assembled. Look carefully and you’ll notice Dr Nefario from the previous films. Gru and his mother are there too. With a nod to female empowerment, the undisputed leader in the field is Scarlet Overkill (Sandra Bullock), the baddest criminal of them all. With her perfect 1960’s flip, she recalls Mary Tyler Moore. Her husband Herb (Jon Hamm) suggests Ringo Starr…or is it Pete Townshend? I’m not too sure. The rocking 60s soundtrack features both The Beatles (“Got To Get You Into My Life”) and The Who (“My Generation”) so I suppose it could be either. Which leads into my next point. On the surface Minions is silly fun, but the narrative highlights a lot of delightful in-jokes that should entice hip viewers. Kids won’t get them and frankly many adults won’t either. The floor in Scarlet Overkill’s abode resembles the carpet in The Shining. Stuart greets the fire hydrant he fancies with “Papagena” which sounds like nonsense unless you realize it’s a character in The Magic Flute. Kevin whistles a tune from Mozart’s opera later. Scarlet Overkill’s bedtime story about a big bad wolf is underscored by Prokofiev’s Peter and the Wolf. But it’s not all classical music. Baby boomers should dig the 60s fan service. Minions pop up out of a manhole cover just as the Beatles are crossing the street à la Abbey Road. The minions sing “Revolution”, the “Theme from the Monkees”, and “Hair”. They watch TV while flipping past The Saint, Bewitched & The Dating Game. Alas there are instances where toilet humor shows up like an unwelcome house guest. In those brief moments, taste takes a regrettable detour. However, more often than not, Minions is a feast for savvy pop culture aesthetes and their children as well. 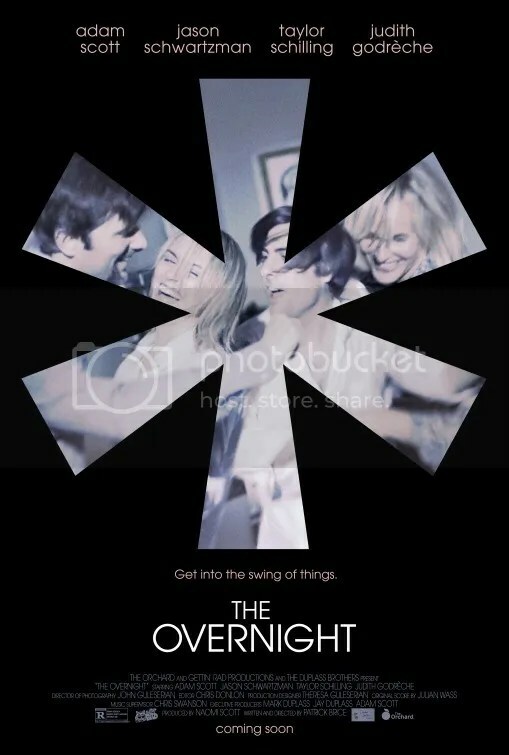 Youngish parents Alex (Adam Scott) and Emily (Taylor Schilling) have recently moved to Los Angeles. Trying to fit in, they are longing to make some new friends. One day while out at the playground with their son (RJ Hermes) they meet slightly odd but seemingly genial Kurt (Jason Schwartzman), whose own son (Max Moritt ) has quickly made friends with the couple’s boy. Kurt invites them over for pizza. They tentatively accept. Using “slightly odd but seemingly genial” to characterize Kurt also kind of describes this film. At Kurt’s grand estate, they meet his French wife, Charlotte (Judith Godrèche) whose smiley demeanor is particularly welcoming. As the evening progresses, the conversation is pleasant. The kids grow tired of playing. The parents agree to let them sleep over. They put them to bed. Then things really get weird. For a while, you question what is the point of all his. Then it becomes clear. Writer/director Patrick Brice has fashioned a whole comedy around male insecurity. It’s the squares vs. the swingers. Their night of discussion highlighted by an escalating series of outré moments: Charlotte’s acting career, Kurt’s paintings, a dip in the pool, a wine run excursion. I’ll admit there are a few mildly amusing bits here and there. It’s sort of like if Woody Allen directed Bob & Carol & Ted & Alice. Unfortunately, what this ultimately leads to doesn’t justify the entire evening that we have endured with these people. The punchline of an ending is pretty limp. This is a comedy skit, not a movie. Size doesn’t matter. Yet it’s only a mere 79 minutes. Still I wouldn’t have even spent that much time in their house. Honestly I wish I hadn’t even attended in the first place. Have you ever had the feeling as you were falling asleep or waking up, that you couldn’t move? You’re between sleep and consciousness. You need to wake up but you can’t. You may have even felt like there was a presence in the room, either hovering near your bed — or even sitting on your chest. This is a phenomenon known as sleep paralysis. It may occur only once in your life. It may happen many times a year. Figures are unreliable and vary widely but 65 percent of the population may endure it at some point in their lives. Understanding the science behind the experience helps people feel less distressed after an episode. Believing the condition is brought on by the supernatural, on the other hand, makes people feel more unnerved. The latter course is how director Rodney Ascher has decided to approach this subject. Rodney Ascher is best known for his 2012 documentary Room 237. In it he invited individuals to speculate about hidden meanings found in Stanley Kubrick’s film The Shining. It was a speculative (read far-fetched) work that achieved some notoriety. 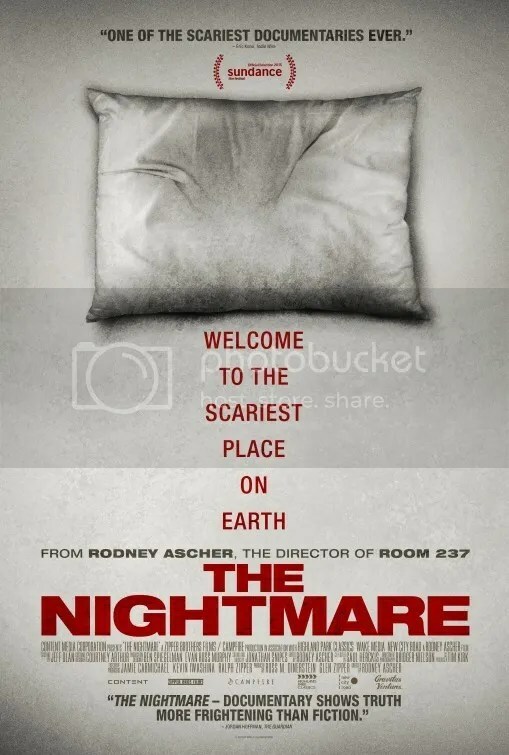 Now Ascher has returned 3 years later with another work of non-fiction called The Nightmare. This time he has chosen the study of sleep paralysis and focused on 8 people who regularly suffer from the disorder. There are valid scientific explanations for what happens during sleep paralysis. However The Nightmare chooses to ignore all that and just indulge in fantasy. As a horror flick it’s suitably eerie. After all, the fear is very real for some people. If you’ve ever faced one of these episodes, the film will certainly resonate. In fact, a common side effect in many cases is that victims were able to cause other people in their lives to experience the same condition simply by explaining what they felt. This gives the movie an almost viral like possibility to create genuine dread in the lives of those who watch. If that appeals to you, tune in. What saves The Nightmare from lack of hard data, is the frightening recreation of the ordeals that the various subjects describe. There is a remarkable similarity to many of the experiences. Visions of shadowy figures, ghosts, demons, cats, even aliens are seen during these attacks. This makes the picture an extremely effective horror tool. However as a documentary on the topic, it lacks much factual information. There are some theories thrown about but no scientific information as to explain why people suffer from these incidents. Sleep paralysis has been around for centuries. An interpretation of a 1781 oil painting by artist Henry Fuseli attests to this. So where are the interviews with doctors who specialize in sleep disorders? Couldn’t they demystify these bizarre episodes? Perhaps that would take away from the movie’s real intent to simply scare the audience. It does a decent job. Writer Maya Forbes’ (TV’s The Larry Sanders Show) directorial debut is based on her reminiscences of her father — who had bipolar disorder. Set in 1978, our saga focuses on a period when she was 10 years old. He was the primary caregiver for Forbes and her 8 year old sister while their mother was studying for an MBA at Columbia Business School in New York City. Two free spirited daughters being raised by a parent with mental illness, proves to be a formidable task. The cast is likable. In the movie, the young Maya Forbes is portrayed by her actual daughter in real life (Imogene Wolodarsky). Although the character is fictionalized as Amelia Stuart. Her younger sister China, is named Faith here (Ashley Aufderheide). Both actresses are making their feature film debuts and both are warm and natural. They give the film a genuine, unaffected element. Mark Ruffalo and Zoe Saldana are parents Cam and Maggie Stuart. They’re pleasant enough but their performances are a bit more studied. In particular Mark Ruffalo’s manic depressive father alternates between wacky dad and weird dad. One minute he’s telling his daughters to join him in the forest to pick mushrooms. The next, mother is locking herself in the car with her daughters to escape his scary behavior. Unemployed Cam never gives the slightest indication he is capable of raising two daughters alone, so it makes Mom’s decision to leave them in his care perplexing. 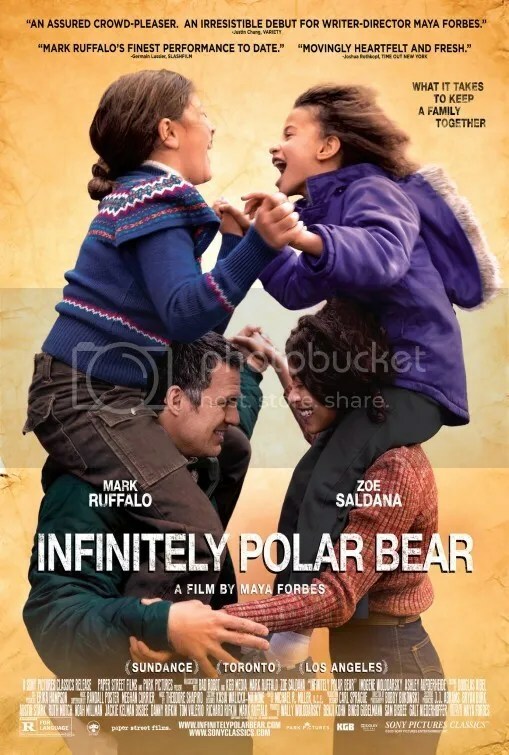 Infinitely Polar Bear seeks to put a smiley face on dad’s affliction. That colors this account as a very shallow production. The lives of Father and his 2 daughters are presented as a series of highs and lows with little insight into any of it. As the filtered recollections of a child, that would explain the lack of sense. Obviously the autobiographical tale is a personal project for Maya. Her husband, Wally Wolodarsky, even co-produced. She presents this earnest drama as a sugarcoated valentine to her father who passed away in 1998. I’ll give the chronicle points for heart and sincerity. But Maya Forbes can’t seem to make the events in these people’s lives seem like anything more substantial than quirky gimmicks. The production is merely a whimsical roller coaster of contrivances designed to tug at your heartstrings. Infinitely Polar Bear comes across more like a sunny sitcom called My Goofy Dad than a thoughtful portrait of a man suffering from a serious mental illness. Malcolm (Shameik Moore) is a straight A high school geek constantly pushed around at school. His dream is to get into Harvard after graduation. This coming of age story sounds familiar right? OK now let me add that he lives in the Darby-Dixon neighborhood of Inglewood nicknamed “The Bottoms”. He loves 90s hip hop and desses like the 4th member of Bell Biv DeVoe. That’s different because this is 2015. He lives with his single mother (Kimberly Elise) and he’s never known his father. His two best friends are Jib (Tony Revolori) and Diggy (Kiersey Clemons) with whom he has formed a punk band called Awreeoh (pronounced “Oreo” because…oh do I even have to explain it?). Life is tough for Malcom. He’s picked on by bullies who want his shoes, harassed by neighborhood thugs who want his bike, and belittled by the school counselor (Bruce Beatty) for his Harvard dreams. The playful tone is shattered when the drug dealer’s (rap star A$AP Rocky) party they’re attending, ends in a shower of bullets and a police raid. They escape. However back at school Malcolm discovers several bricks of Molly (MDMA in powder form) and a gun have been stuffed in his backpack. Now he and his friends must find a way to get rid of the drugs without getting killed or locked up. Dope is one of those movies that really demands a lot from its audience. Smart viewers will think of easier ways out of this mess, but the screenplay doesn’t see it that way. It’s a progression of convoluted occurrences with a hodgepodge of zany gags bolstered by glib racial commentary. Shootings played for laughs and kamikaze disrobings by a sexually promiscuous coke fiend (Chanel Iman) are clumsy attempts at humor. Her filmed outdoor embarrassment becomes a social media meme because well “the Internet”. The script works hard throwing all sorts of random bits at the viewer. It’s a desperate attempt to be funny but the awkward mix of violence and lighthearted shenanigans are tonally off putting. 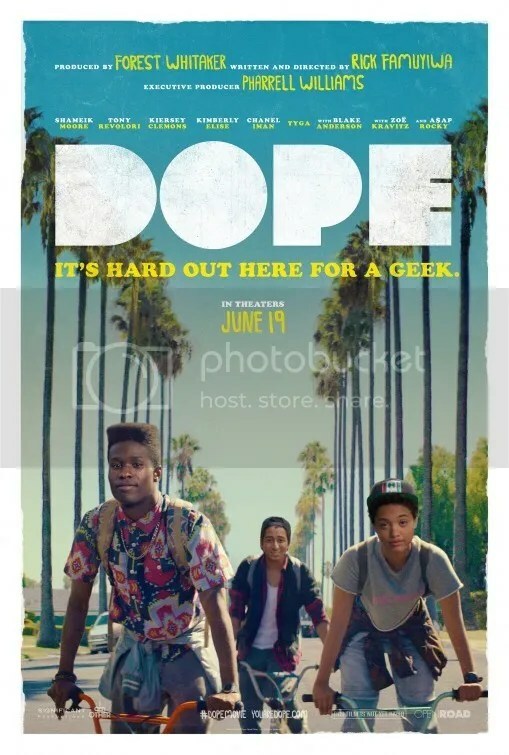 Dope is highlighted by a game attractive cast. There are moments, mostly in the first half, that had me laughing at its amusing view of nerds in the ‘hood. But the narrative is sloppy. The film vacillates between subverting stereotypes almost as often as it exploits them. I liked Dope when it did the former and not so much when it succumbed to the latter. Malcolm’s college application essay for Harvard is literally spoken at the end as a kind of justification for his actions. It’s a risky (business) move because Malcolm has done many questionable things. Oh and I must fault a script too oblivious to point out the pun that a black male uses blackmail. Talk about a missed opportunity. The author (read screenwriter) has clearly fashioned the moment as a call to stand up and cheer. I suppose life is a series of choices and not everyone is faced with the same ones. Fair enough. Still it’s hard to hang your hat on a movie where the apparent moral is “If you can’t beat ’em, join ’em”. On paper, a sequel like Magic Mike XXL shouldn’t work. It has no plot and no conflict. The director of the original surprise hit has changed (Steven Soderbergh is editor and cinematographer), and major star, Matthew McConaughey, is gone. This is simply a road trip movie with a bunch of guys hanging out, who also happen to strip for a living. They’re on their way from Florida to Myrtle Beach for the annual strippers’ convention. They have conventions? None of them are getting any younger, so this is seen as their last hurrah together. Their vehicle, an old ice cream truck, makes stops along the way. Friends are made in different locales. Magic Mike XXL stars men, but it’s really about the women. Those they meet on the trip and those for whom they entertain. There’s Nancy (Andie MacDowell) who hosts a group of well-to-do Southern ladies sipping wine at her luxurious estate or Rome (Jada Pinkett Smith), the proprietor of a ladies’ club that caters to an African American clientele. At a beach party Mike meets Zoe (Amber Heard), an acerbic love interest in a truly expendable character. In between getting from point A to point B they perform shows. The gang’s routines relied on the “classics” in the first film – the fireman, the cowboy, the military number. This time Mike (Channing Tatum) seeks to reinvent their show so that it’s more fun for them to act. He hopes their renewed passion will invigorate the show. Joe Manganiello as Richie steals the spotlight, not once, but twice. In the finale, Joe Manganiello outfitted in a tux, mock proposes to a girl in the crowd. He walks her through a wedding ceremony while Donald Glover sings Bruno Mars’ “Marry You” in the background. (Oh Matt Bomer sings a couple times too and it’s shockingly good.) Then comes the wedding night and “Closer,” by Nine Inch Nails plays. The performance is prurient, but it’s also creative. There are some genuinely hilarious moments too. The guys dare Richie to walk into a gas station and make the unhappy plain jane behind the counter smile with a dance routine to the Backstreet Boys. The scene has a sexual bent but its overall gist is one of sweetness. The scene is shot to amplify the energy of the club. Star Channing Tatum is charismatic and he can dance. Now I’m not talking the smooth elegance of Fred Astaire or the dazzling technique of Gene Kelly. But Channing exhibits an athleticism that draws on the bump and grind mentality of the tradition. The choreography employs enough gravity defying flair with physical lifting to make what he does seem difficult. His earnest “let’s-put-on-a-show” ethos is infectious and he heads up a cast of dudes that really just want to entertain. Their heart is in the right place, even if their chosen profession is a bit salacious. They enjoy hanging around each other almost as much as they enjoy being onstage. It’s their friendship that unites the spaces in between musical numbers. These are nice guys who happen to be in great athletic shape. In most movies they would be stereotyped as greasy jerks. But these buddies don’t put anybody down and they never act in a mean-spirited fashion. The boys have a relaxed, easygoing camaraderie that is contagious. What elevates the production is the utter feeling of positivity. Good vibes surround the film. The boys are charming. They have big hearts and they want to make the audience feel good about themselves. Their performances are highlighted by spectators that are average everyday women. These are not gorgeous models picked out of central casting, but average girls who are missing something in their lives. The analogy is made that the dancers are like shrinks catering to “queens who need to be worshiped”. They’re selling a fantasy. The bros are manipulative, but so is the drama. The picture never pretends to be anything less. 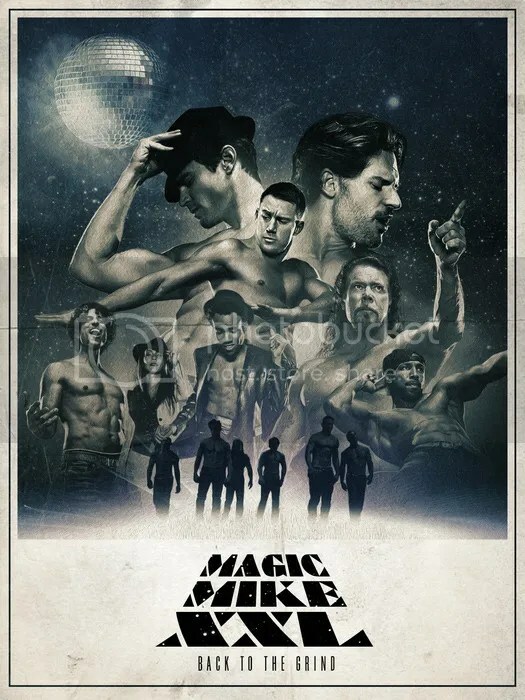 Magic Mike XXL is such a pure film, it’s practically revolutionary. It’s a surprisingly lighthearted production given the subject matter. The whole thing has an uplifting view of humanity that I wasn’t expecting. Yes the narrative is a (ahem) skin deep examination of this lifestyle, but it’s still a better movie than it has any right to be. Welcome to Fast Film Reviews. My name is Mark Hobin. I love film and I love to write so I thought, why not combine the two. This is the inspiration for my movie review blog in which I currently review every movie I see in a theater. Please enjoy and leave a comment if you like.